Ideal for high throughput applications, fast mixing-dependent reactions and fast, highly exothermic reactions requiring temperature control! A range of ingenious glass static mixer blocks designed by Uniqsis to provide efficient turbulent mixing throughout the block. Precision machined from borosilicate glass and chemically inert, the mixer blocks incorporate 1 mm id channels with active mixing geometries. These promote both diffusional and turbulent mixing, as well as functioning as very efficient heat exchangers. Static mixer chips may also be utilised to promote efficient emulsion formation in multiphasic reactions thereby leading to significantly enhanced rates of reaction in favourable cases. 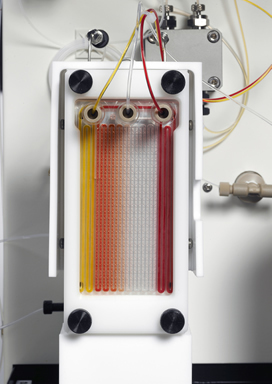 Mixer blocks can be attached to the FlowSyn column module or to FlowSyn Cold for heating and/or cooling, with reagent tempered prior to mixing.